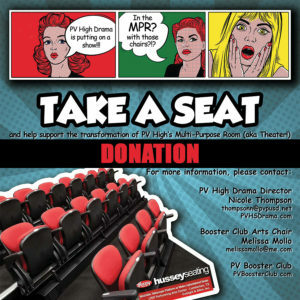 Together with the PVHS Booster Club, PV Drama is pleased to announce an exciting campaign to raise funds for the purchase of portable, retractable theater seating. If you’ve ever attended a PVHS Drama production, you (and your bum) know just how badly the MPR seating needs to be upgraded. Don’t miss your chance to purchase an inscribed name plate and have your student or family commemorated for seasons to come. This unique opportunity will only be available for 176 seats and will available on a first-come, first-served basis. If you do not wish to purchase a commemorative name plate, but still wish to donate to the TAKE A SEAT fundraising drive we are thankful for any amount. 5:30-8:30 pm | Immediately following the Sea King Homecoming Football Game. PV Marching Band, Drumline, Song, and Cheer Squad will be featured. Live music performance by Hurding Kats. Event is free to all Booster Club Members. Alumni family admission is $50. PVHS Student Alumni admission is $10/each. JOIN US! 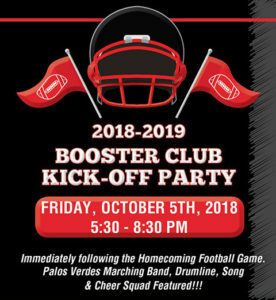 To create the best experience for all students, join the Palos Verdes High School Booster Club today! At PVHS, parents engage by sharing their time, talent and treasure to boost the Academics, Arts and Athletic experiences of our kids. The Portofino was a beautiful location for Catch the Wave 2018. Check out the photos posted by Walk Through Productions. Have photos to share? Email to Webmaster.